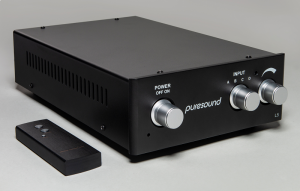 The new puresound L5 is a compact, high quality, line level pre-amplifier. 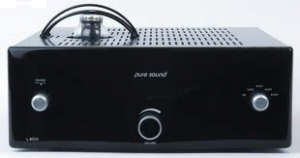 Following the positive response to our flagship L300 pre-amplifier, puresound has developed the L10, a new, more affordable design which incorporates much of the thinking that makes the L300 so highly regarded. The L10 has 4 inputs, a separate passive Record In Record Out loop and two pairs of single ended outputs. The circuit uses output transformers and a sophisticated full valve rectified, twin choke smoothed power supply. It also offers remote control of the volume via a separate handset. The Sugden Masterclass LA-4 is a line level stereo pre-amplifier with authority, finesse and the capability to develop a sound stage with imaging, dimensional realism, and time/space elements in perfect harmony. The units primary function is ‘Simply More Music’ with a neutrality to allow end users to choose mating components and obtain customised performance. L300 has 5 inputs and twin outputs (2 pairs single ended and 2 pairs balanced via XLR). The circuit uses output transformers and a sophisticated full valve rectified, choke smoothed, regulated power supply including a 300B triode as the series element. A Line Stage pre-amplifier needs to offer the facility to select between different sources, to provide some means of attenuating the chosen source and then deliver it in an uncorrupted form to the power amplifier.